Up to 49% of veterans struggle to find employment in their preferred line of work after leaving the military. For most, this is simply because they fail to find a job at the level they want. Some lack sufficient training and experience, while others just don’t have enough information on how to get going. Animal-related jobs do not often feature high on the list of veterans’ post-military options. This is despite the fact that the Bureau of Labor Statistics projects that work opportunities in the industry will grow at about three times more than the average of all other occupations in the next decade. For veterans with a passion for animals, there are some good career options to pursue. There are various paths one could take as far as careers in animal safety and protection go. One of the options is to work as a humane educator. Humane education involves training people on how to be compassionate and protective of animals and other living beings. More than a dozen states have humane education as part of their curriculum, with half of those specifically focused on animals. On average, a humane educator earns between $27,000 and $35,000 annually. Another career option in animal protection is management of animal shelters. This could be done as a personal business venture, or an employment opportunity. Animal shelters provide a home and rehabilitation center for animals that have been abandoned, lost or even surrendered. Managing an animal shelter primarily entails overseeing daily operations of a center, but could also extend to involving the community to help promote the safety and welfare of animals. Annual salaries for shelter managers could range from anywhere between $40,000 and $60,000. For those with a background or passion in animal medicine, the obvious route is to work in veterinary care. Veterinarians are the highest-ranked professionals in this category, with technicians, nurses and assistants working under them. The path towards becoming a veterinarian is a longer one, however, as it requires one to acquire a doctorate in veterinary medicine and to become licensed and certified. A veterinary technician license, on the other hand, only requires two-years’ worth of prior training. A certified veterinarian makes an average of about $90,000 every year, while the average annual income for a veterinary technician is about $31,000. 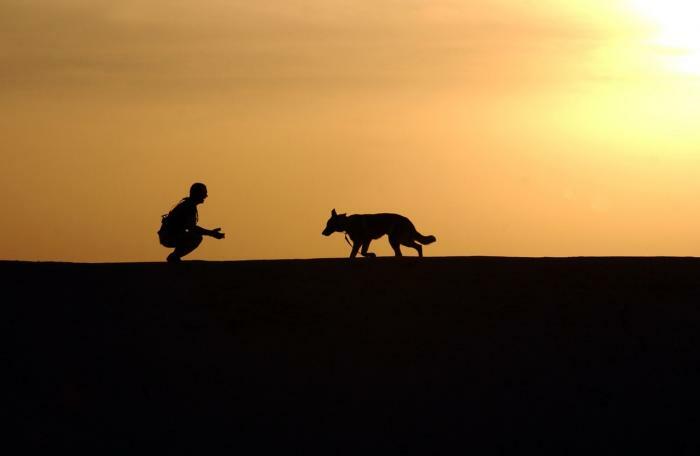 Whenever animal training is mentioned, most people will probably think of dog training for security purposes. And while the niche there is pretty wide (there are up to 20,000 service dogs in the US), there are so many more career options that exist in animal training. These include movie animal training, which involves teaching desired behaviors to various animals in order for them to feature in films. One advantage of working as a trainer of animals for movies is that there is no formal education required, but a downside is that the work can be very demanding. Dog trainers can earn $25,000 per year on average, while professionals who train animals for film and TV could earn as much as $35,000. These and many other options exist for veterans who love animals and want to spend their post-service life working around them. Job opportunities in animal care and training provide a chance for veterans to make a decent living and can also be very good for their overall well-being.